Another Long Walk: To Milan! 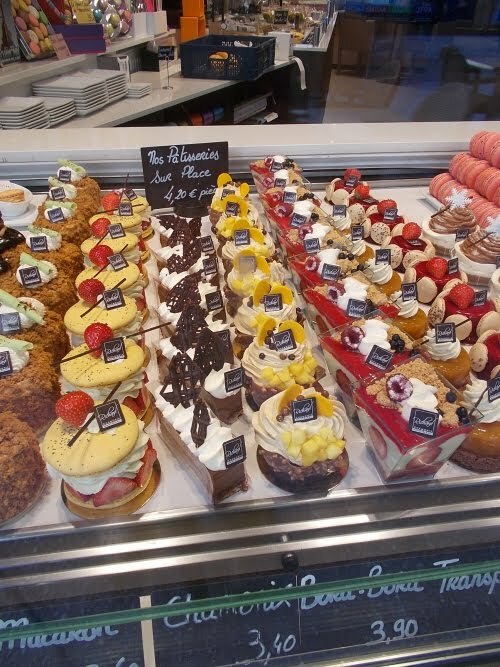 September 6: I had three major items on my to-do list for Europe. Tour Mont Blanc was the first, and I had checked it off. Item #2 was a trip to the World's Fair, currently being held in Milan, Italy. I'd been thinking about hitting it for a few years now, ever since I read The Devil in the White City. The book was about the 1893 World's Fair in Chicago, and while reading it, it occurred to me that the World's Fair used to be a really big deal. I see evidence of it almost every day I'm in Seattle when I look across the water from West Seattle and see the Space Needle towering above the city skyline--built for the 1962 World's Fair right here in Seattle. The first of four buses I'd be riding today I caught here in downtown Les Houches, France. The Eiffel Tower.... also built for the World's Fair. The Ferris wheel--invented for that 1893 World's Fair in Chicago to one-up the Eiffel Tower. Ice cream cones--another World's Fair invention. I also searched for lodging in Milan. Hosting an expo that millions of people were expected to attend, I was a little concerned that lodging could be difficult (and perhaps expensive) to find. While I'm certainly okay with camping, living like a homeless person in a downtown park didn't strike me as a wise idea. Being September, and a weekday, I hoped this counted as the "off-season" and lodging wouldn't be difficult to find. The hotels were all crazy expensive, so I settled on a hostel a few miles from the downtown core that had space available. And finally, I needed to get myself there. Milan was, roughly speaking, about 150 miles (250 kilometers) to the east. As you might imagine, there are not many direct buses from Les Houches, France, to Milan, Italy. 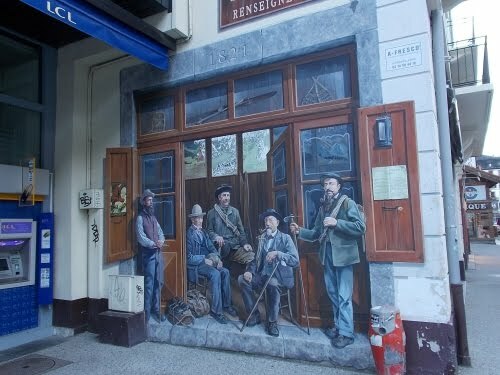 My favorite sight in Chamonix was this mural on the wall. Pretty much everything on that wall is a painting except for two small windows. The detail is absolutely stunning and incredibly life-like! With a little help from the tourist office, I figured out a route. 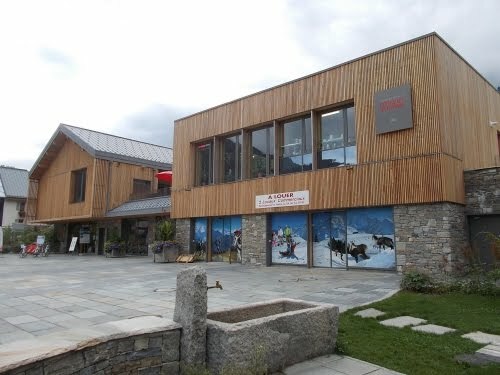 I took a shuttle bus from Les Houches to Chamonix--which was free for me because the hostel I had stayed at provided the bus ticket at no extra cost. But that only got me about 5 miles. And I just wandered around town admiring the views and scenery. That same mural, but a close-up of the bottom part of it. It looks like you could just walk right into that building, but you'd really just walk right into a solid wall! 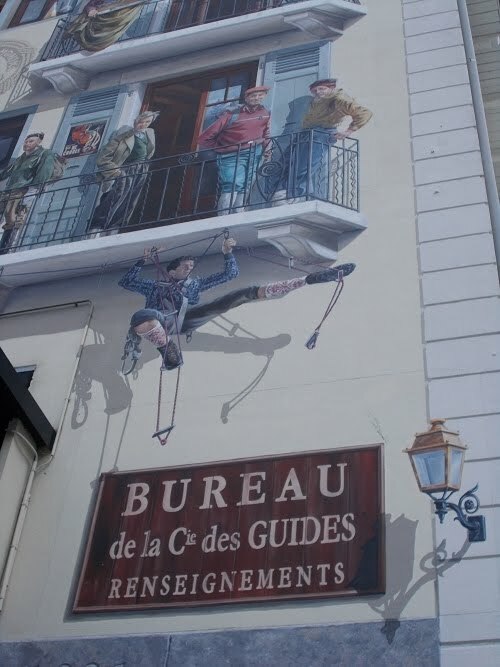 I really liked the idea of a climber goofing around under the balconies of the wall, but both the climber and balconies are just painted onto a solid wall! Even the shadows are painted on! That light in the bottom corner--just a painting! Even that street sign is just a painting! 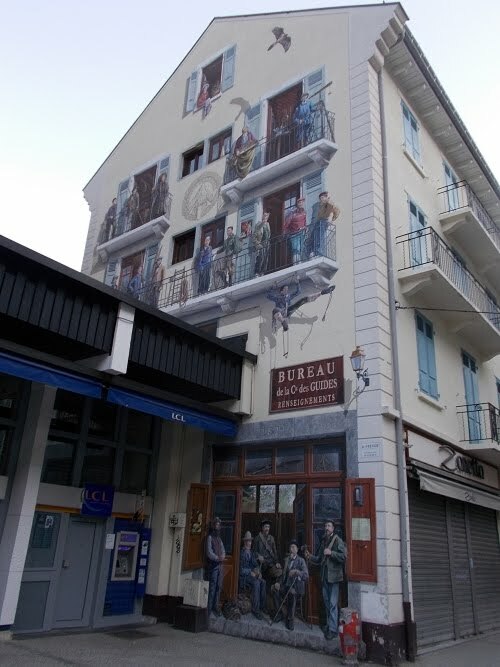 This is really one of the most remarkable murals I've ever seen! At the allotted time, I caught the next bus of my journey, which would take me over the French border and into Courmayeur, Italy. If Courmayeur sounds familiar, that's because it's the very same town I walked through on day 4 of my Tour Mont Blanc hike. More shocking, however, was the tragedy that occurred on the morning of March 24, 1999, when 38 people died in the tunnel after a truck in it caught fire. (Most of what follows comes from Wikipedia--there's a lot more detail there, though.) A Belgium transport truck carrying flour and margarine caught fire. It wasn't the first vehicle to catch fire in the tunnel (16 other trucks had done the same during the tunnel's history), but those fires were quickly extinguished. This fire, however, grew out of control and the driver wasn't able to put it out. Eventually, the smoke pushed him away and the fire continued to grow in intensity. 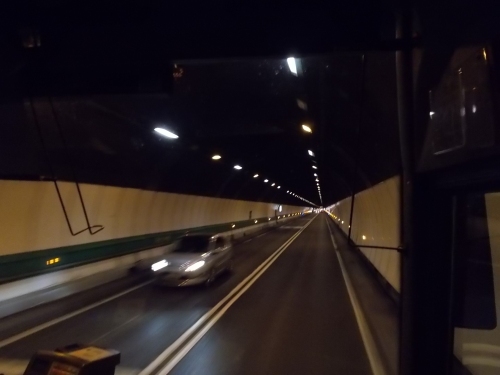 Some of the smaller passenger vehicles in the tunnel were able to turn around, but they were hindered by the dense smoke, and the larger trucks couldn't even turn around. Most drivers rolled up their windows and waited for rescue. 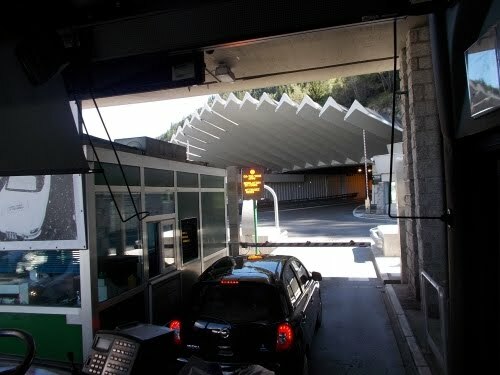 The ventilation system became an issue as well, pushing the smoke down the tunnel faster than anyone could outrun it. The fumes quickly filled the tunnel and caused engines to stall due to lack of oxygen. When the engines on the fire trucks sent to the scene also stalled, the firefighters had to abandon the trucks. The growing fire caused other problems as well. The fire had melted wiring plunging the tunnel into darkness. In the smoke with abandoned and stalled vehicles blocking their path, emergency vehicles could not get in. After fire crews abandoned their vehicles, they took refuge in emergency fire cubicles, from which they could hear burning fuel roll down the road's surface popping tires and exploding fuel tanks. They were rescued five hours later. Of the 15 who were trapped, one died and the other 14 were serious condition. The fire burned for 53 hours up to temperatures of 1,000 °C (1,830 °F), mainly because of the margarine load in the trailer, equivalent to an oil tanker, which spread to other cargo vehicles nearby that also carried combustible loads. In all, 27 people died in their vehicles while another 10 died while on foot trying to escape to safety. Of the initial 50 people trapped by the fire, only 12 survived. And that was the tunnel my bus would pass through. I certainly hoped my trip through would be less eventful! The tunnel had been closed for three years after the fire, both to repair all of the damage and to build additional safety improvements so an event like this never happened again, including a parallel escape shaft and a fire station (an entire fire station!) in the middle of the tunnel. Each entrance for the tunnel now has safety inspection areas and all trucks are inspected before they can enter the tunnel. 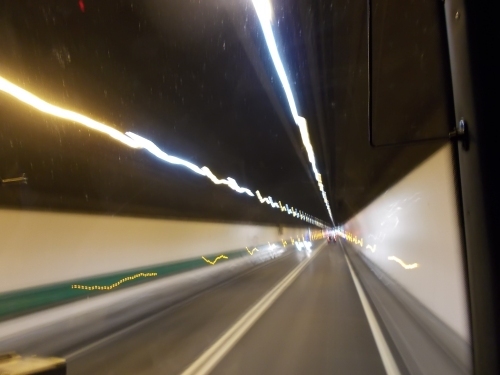 The trip through the tunnel was, I'm happy to report, was uneventful. The bus dropped me off in Courmayeur less than an hour after we left. I'd made it to Italy! 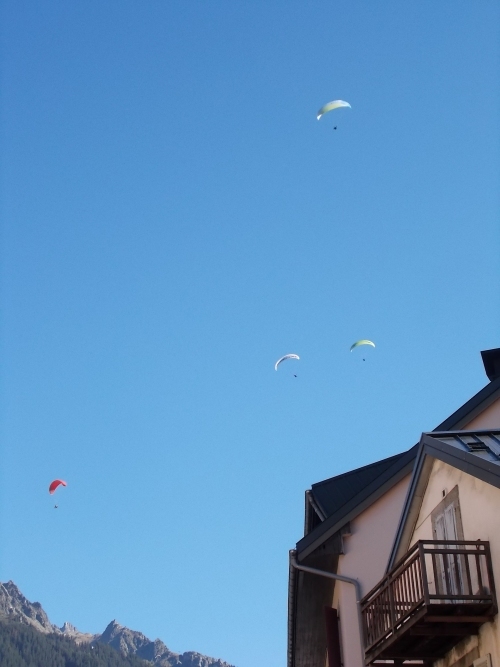 Lots of hang gliders in the air! A beautiful day for it, too! 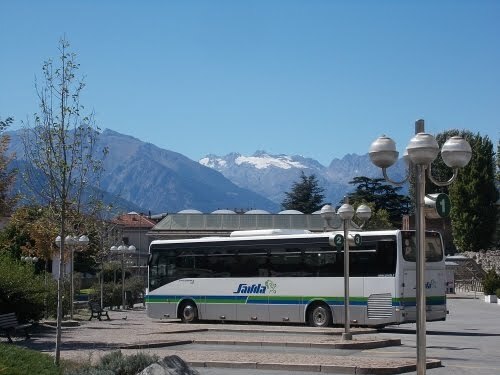 I then switched buses yet again in Aosta. Strictly speaking, I didn't have to do that. 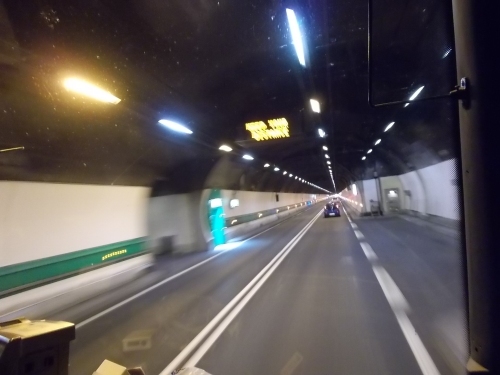 The next bus out of Courmayeur would have stopped in Aosta then continued directly on to Milan. The earlier one I took would go no further, so I had an hour or two to bum around Aosta to catch the next bus which would have been the one I'd have been on if I'd just waited for the next bus out of Courtmayeur. But I figured, hey, when will I ever have the chance to walk around Aosta again? I'll take the extra layover! 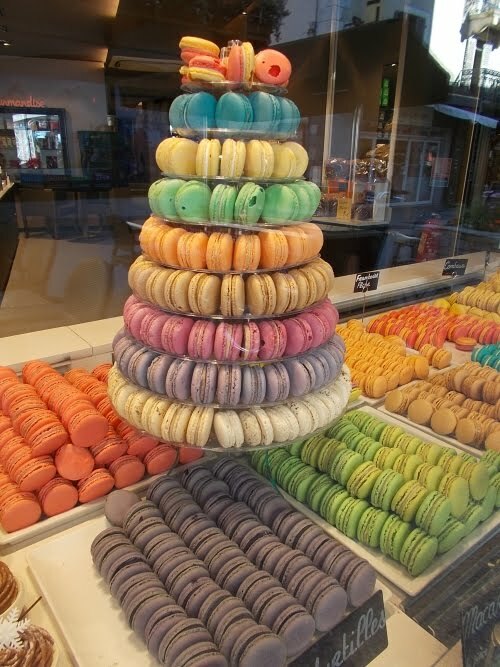 =) It won't get me into Milan any later--may as well! The town was someone disappointing, though. I arrived near lunch and the streets seemed eerily deserted. Very few people walked around and almost all of the stores were closed. It was an industrial kind of town--at least the area where the bus dropped me off was--and nothing I saw I'd consider 'scenic.' And it was hot! 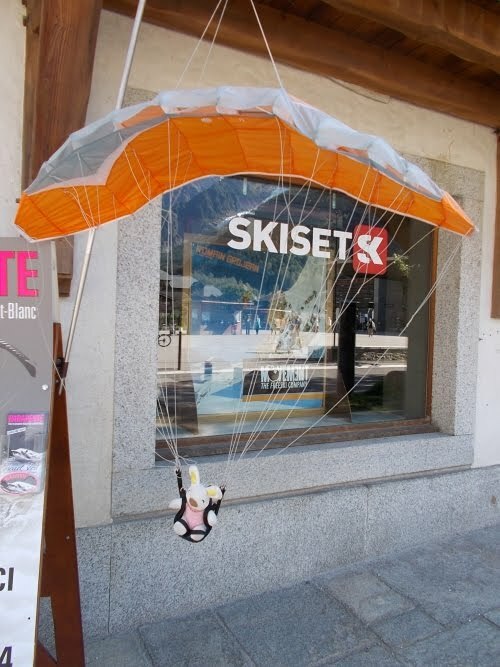 Out from Courmayeur, the elevation dropped rapidly and temperatures warmed. 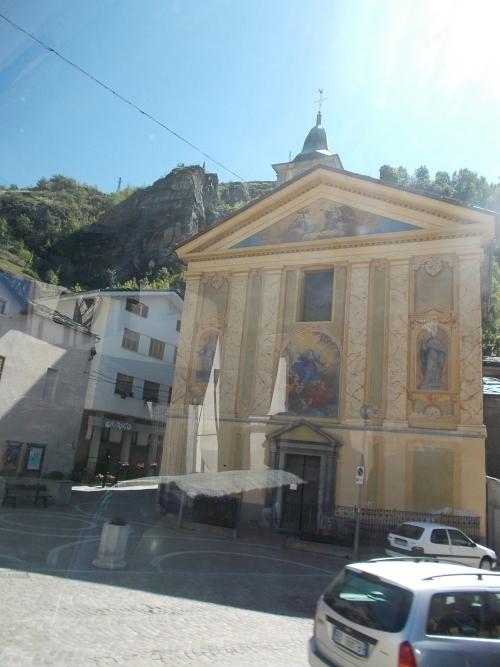 On the air-conditioned bus, I didn't really notice the change, but walking around Aosta, I certainly felt it. Eventually I found a shady spot to wait for my bus and read my Kindle. A couple of hours later, I exited the bus. I was in Milan! But I wasn't done with navigating the transit systems just yet. Nope, now I had to figure out how to get to my hostel. 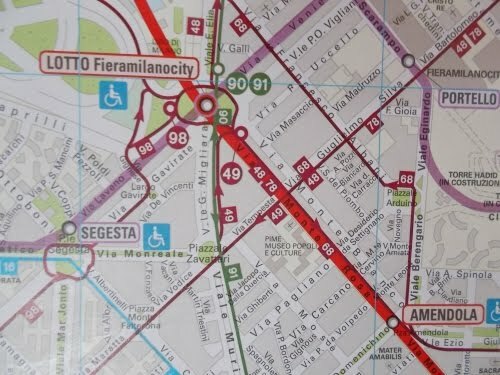 I wasn't even entirely sure exactly where in Milan I was, but the large transit maps hanging around the station helped me figure that out quickly. 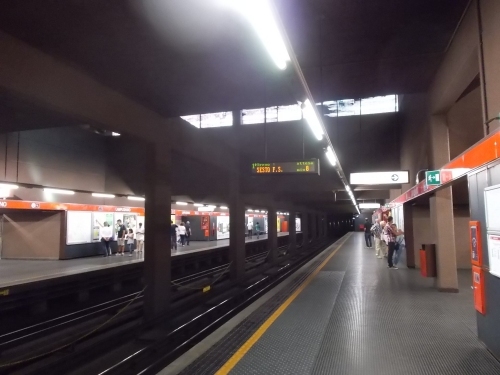 I figured out both where I was and where I needed to be, and found a subway line connecting the two locations just a few stops away. I fumbled around with a ticket machine. Fortunately, there was an English button, which I pushed. It took a couple of tries, but eventually I pressed the right sequence of buttons that spit out a ticket. I found the subway entrance, and made sure I was on the correct side to pick up the train going into town. I made a mental note of everything--I'd have to ride the subway again later to get to the World's Fair. And maybe use it to get downtown, although the hostel was close enough downtown that I'd probably just walk it. I love subways--so fast and efficient, cutting through traffic like it wasn't even there because, it isn't! When I reached my destination, though, it's confusing at first. I come out of the subway like a groundhog poking his head out of the ground, and in a city I've never been, nothing looks familiar. Which way is north? Even when I see a street sign--ah! Yes, that's the street I need to follow! But which direction? It took me a good five minutes to get my bearings and figure out which way I needed to walk to my hostel. And late in the afternoon, I finally checked in. I was put in a room that could fit six people, and the room was full. I got a top bunk, and the guy who set up in the lower bunk looked like he had created a fort with towels wrapped around the edge of his bed as a privacy screen. Which seemed kind of weird to me, but I didn't really care. 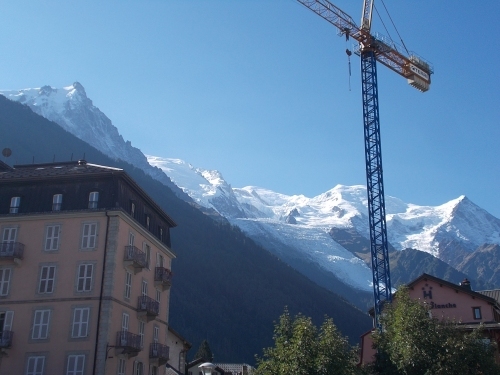 Views around Chamonix are gorgeous! 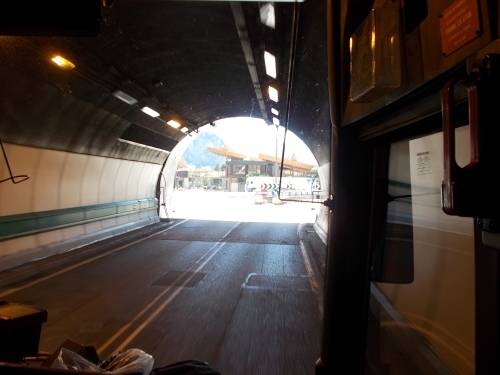 Entrance to the Mont Blanc Tunnel, the scene of a horrific tragedy in 1999. In the tunnel! Buried by more than a mile of granite! Still in the tunnel.... did I mention that the tunnel was over 7 miles long? It takes a while to get through! Finally--the light at the end of the tunnel! And Italy! We're now in Italy! My chariot from Courmayeur to Aosta. You keep changing countries, both during your hike and after, but I haven't heard you mention passports at all. How does that work in Europe? It would seem to be easier to put up passport stamping places on roads than mountain trails. How would they even keep track of people hiking in? Or don't they bother? Moving from country to country in Europe is like moving from state to state in the United States. I never had to show my passport to anyone during all of these border crossings because there's no one to show it to. I "checked into" Europe when I arrived at the airport in Barcelona--which required a passport, and that was that. With the formation of the EU, borderless travel within the member nations (and a few non-members who have opted in) was established. So as of about 2000, no passport needed internally for most of Europe.